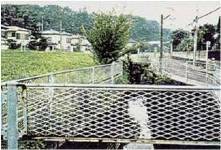 In the first half of the ’90s, basic research related to animals and plants in watershed areas of Izumi River was conducted for preparation of river restoration and scenery and a land utilization program was launched while preserving biological resources. Today, Izumi River attracts a great deal of attention from people engaged in river restoration work as a good case example of reproducing diversity of the river from the viewpoint of the waterfront ecological system and landscape and river utilization by citizens although it is an urban river. In 2005, this project won the highest design award of the Japan Society of Civil Engineers’ Design Prize.